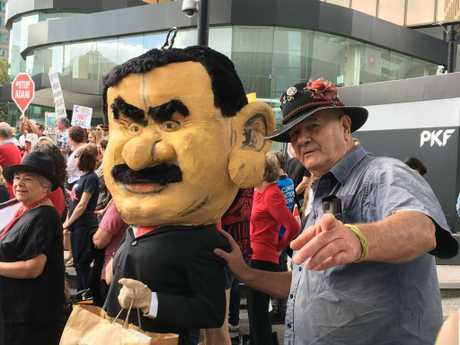 An Adani protest in Brisbane. 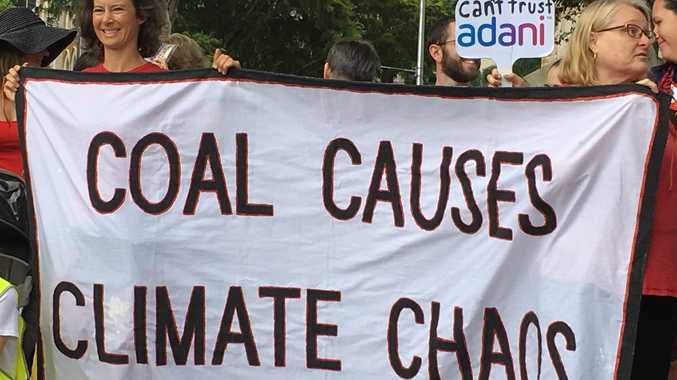 Indian energy conglomerate Adani's proposed coal mine located in North Queensland's Galilee Basin is the worst possible thing we can do to the Great Barrier Reef. With half the coral lost in the last two years, it is looking more and more likely that there will be nothing left in the next 15 years, and perhaps sooner, if the Adani Carmichael Coal Mine goes ahead. One of the biggest problems with the mine is the carbon emissions from extracting and burning coal, contributing to a fast warming of our climate, which has created a land of extremes, especially in Queensland. Over 200 million tonnes of carbon dioxide will be produced over the 60 year life of the mine. We are already scrambling to deal with the financial, economic and environmental costs of prolonged drought followed by short, sharp bursts of intensified storm or cyclone fuelled deluge. In these sorts of dire climatic conditions, it is likely that contaminates from the mine would pollute groundwater and nearby waterways, and the water-intensive mining would leave bores and artesian basins bone dry. Two hundred litres of fresh water are sucked out of the ground for each tonne of coal produced in most mining operations, including Adani's proposed coal mine. 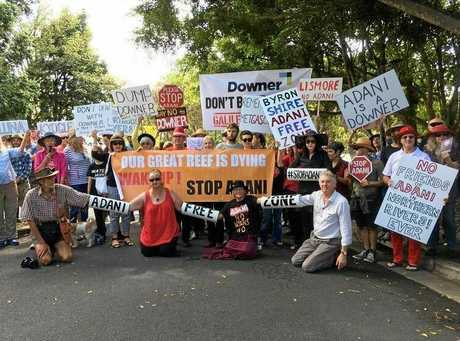 Adani protest outside Lismore City Council. Another environmental consideration is the 500 extra coal ships that will be required to travel through The Great Barrier Reef World Heritage Area with the associated risks of groundings and oil spills on the reef. 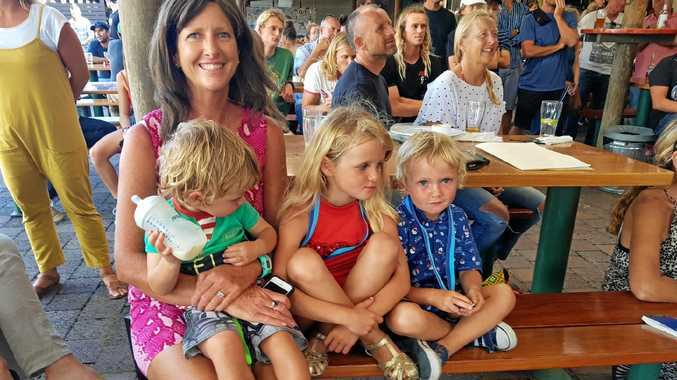 Risk of boat strike injury and the death of humpback whales and their calves would be likely as they are known to frequent the Abbot Point area during their migratory season. It is ludicrous to think that the Federal and State Government are pouring $1 billion into this project, with an extra $31 million coming in from the Rockhampton and Townsville Councils to build an airstrip for the coal mine. The justification for this is that the Adani coal mine will create more jobs and consequently boost the local economy. This is hard to believe, with the masterminds behind the project boasting that most of the operation will be automated, including forty five 400 tonne driverless trucks and many of the mining workings undertaken by robots and machines. With Queensland's unemployment rate currently at 6%, and comparatively lower than what it has been in the past 5 years, it seems an unreasonable focus for our State and Federal Governments. The Australian Government in a press release stated that the Adani coal mine would create 10,000 jobs, a figure many have questioned, especially as these jobs would likely come at the expense of mining jobs elsewhere in Australia. Another point to consider, is that the setting up of a renewable energy plant would require many more hands on deck to plan, man and develop, and the end result would be cleaner, greener energy. Also, with the destruction of the Great Barrier Reef, imagine the significant cost this would have on the tourism industry in North Queensland, which is so reliant on the tourist dollar. That $1 billion government subsidy would be better spent on saving the reef, not destroying it. The Indian energy conglomerate has had a checkered past, having breached environmental laws by destroying and blocking creeks to reclaim land in India. 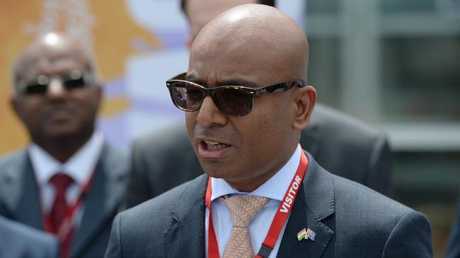 Indian fisherman accused the mining company of dumping sand in local waterways and having a direct impact on the sudden. A dramatic decline of fish stocks correlated with the development of a coal power plant and port nearby. Interestingly, Australia's Federal Department of the Environment signed off on the proposed project for North Queensland and did not follow requirements under Federal law to consider the conservation advice regarding three endangered species: the yakka skink, the waxy cabbage palm and the ornamental snake. Australia's G20 commitment to phase out "inefficient fossil fuel subsides" is not worth the paper it was written and signed upon. The planned mine for the Galilee Basin contains six open-cut pits and five underground mines. The surface disturbance area is 27, 892 hectares. The mine site covers an area of 44, 700 hectares, and is around 447 square kilometres, 50 kilometres long. This is bigger than most capital cities, easily covering Paris, stretching out beyond the city's boundaries beyond Versailles. With most of the coal being shipped to India, India would "own" more of Australia than most Australian big businesses. Sadly, there may soon be just six wonders of the natural world. Australia, it's time to make a stand, before we exclaim, "Ah-darn-it, we killed the reef."